Registration costs for this training is $100. 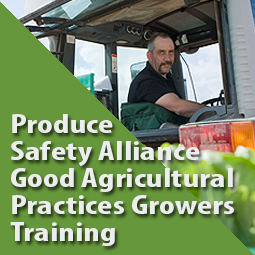 This includes a Grower Training manual, certificate of completion from the Association of Food and Drug Officials, and lunch. Purdue University is an equal opportunity/equal access/affirmative action university. If you require special accommodations to attend this event, please email Amanda Deering 765-494-0512 adeering@purdue.edu. Due to the popularity of this workshop, checks must be received within 5 business days of registration. You will automatically be cancelled if payment is not received by this deadline. Purchase Orders must be pre-approved by The Education Store at 765-494-6794. Cancellation Policy: If you need to cancel for any reason your registration is subject to a $17 cancellation fee. If you have questions about the GAPs course, please contact Amanda Deering, 765-494-0512 adeering@purdue.edu.